A delicious sweet juicy yellow dessert pear. 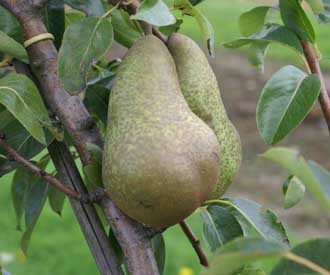 Abbe Fetel pear was raised in about 1869 by Fetel in France and introduced in 1874. It produces large elongated fruit. The skin is yellow when ripe with a high proportion of golden russetting. It has white, juicy, melting flesh which turns slightly pink when ripe. Very sweet aromatic flavour. An excellent and delicious pear. Grown commercially to a small extent in France and Italy and occasionally available in shops in the UK where it is often sold under the Italian name Abbate Fetel. Needs a warm sheltered location for best results.